Item No. Kinetic Model Kits Item No. K48036 - Belgium Air Force F-16A Block 20 MLU "Tiger Meet 2009"
Contents and Media: Approximately 450 parts; markings for one aircraft. A detailed and reasonably accurate F-16A finished in a truly spectacular scheme. Early in 2009, I did a review of the earlier Kinetic release of the F-16C Barak and detailed some minor inaccuracies with the tail parachute/ECM housing extension, some minor panel line inaccuracies and the one that received the most controversy in modelling forums, the nose having too much droop and incorrect profile. Some of these issues are easily corrected and some may be perception, it all depends on what the modeller is happy to accept or correct. From my experience with the Hasegawa and Tamiya F-16 kits, all kits suffer from minor inaccuracies and various levels or lack of detail. During this review I will not go over old ground or compare the kits further but present my conclusions based on the merits of the kit. Having now reviewed seven of the Kinetic F-16 kits and having built at least four, it would appear that Kinetic has corrected the nose droop that was apparent in the early single seat kit releases. 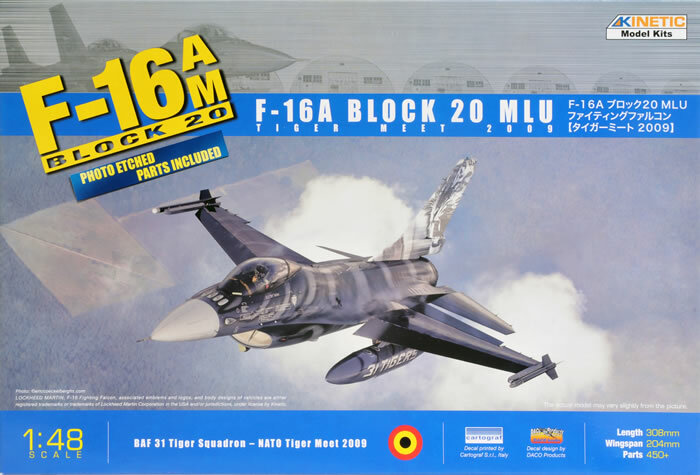 This became apparent through their dual seat versions and with their ROCAF F-16A/B Block 20 – 2 in 1 kit. 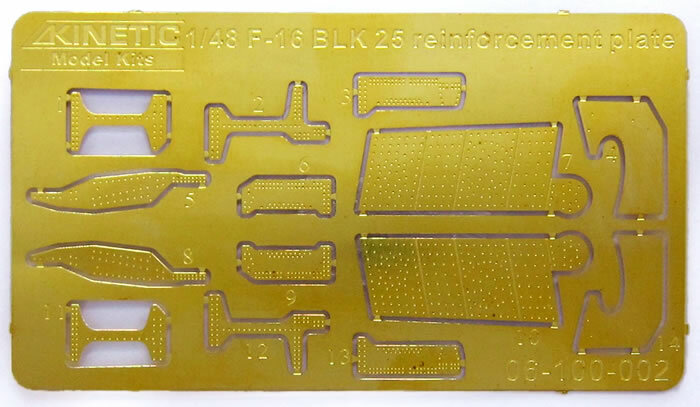 The Kinetic kit comes in quite a large box packed with approximately 450 parts, which is far more parts than any F-16 kit from Hasegawa and more than the Tamiya kit. In reality, a lot of these parts are alternate parts and some will be consigned to the spares box. Also included is a very nice etched metal sheet of parts to represent the reinforcement plates attached during structural upgrades. Not all the weapons provided will be fitted to the Belgium aircraft and particularly not in the Tiger meet scheme, so most will go to top up the spares box. The kit itself is designed to allow the manufacturer to issue the kit in the many versions of the F-16 with minimal mould changes. In fact the kit contains most of the parts to make almost any version of the F-16A. The alternate parts are provided as replacement panel drop in and surface mount detail. Sometimes manufacturers cause fit problems and issues by trying to get maximum mileage out of the kit through alternate parts but in the case of my previous Kinetic F-16 builds the parts fit fine. The surface detail, while not quite as sharp as the Tamiya kit, is still quite crisp and clear. I would rate the surface detail to be very good and will look great under a coat of paint. The detail in the cockpit and wheel wells is sufficient and I am usually an after market detail fanatic but after careful examination of the kit parts and comparing them to the Aires detail sets that I used for the wheel well, cockpit and engine of my Hasegawa kit I have decided the detail is ample and I will not be adding any after market detail to this kit when I build it. The exhaust nozzle is excellent containing full internal detail even to the point that the afterburner flame holder ring is correctly positioned downstream from the turbine discs. My only thought is the petals are a bit thick but still look very nice. Full internal detail is provided on the speed brake petals allowing these to be displayed in the open position. The transparencies are crystal clear but will need a coat of clear smoke or amber to accurately portray the gold impregnated tint colour of the real aircraft. When I looked at the box art prior to opening the kit, my initial thought was that this would be a challenging paint job as the entire aircraft is finished in various shades of grey replicating tiger stripes, including the fuel tanks. I opened the box and instead found this huge decal sheet that has you applying decals to the entire aircraft - amazing but what a relief. The challenge is now to get the decals on with no air bubbles and conforming to the detail. The decals are designed by Daco decals and nicely printed by Cartograf with good colour saturation and crisp detail. F-16A Block 20 MLU Serial number FA-87 of No 31 Squadron in Tiger Scheme for the NATO Tigermeet in 2009-2010. 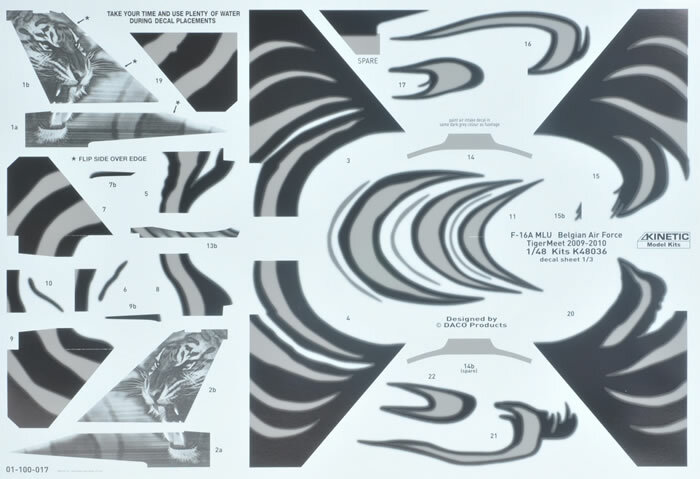 The instruction sheet gives a good level of breakdown and clear instruction while the painting and decal instructions are in black and white and provides excellent colour scheme and decal placement detail. Kinetic's latest release will look like a detailed and reasonably accurate F-16, and a very nice one indeed straight from the box with no expensive aftermarket detail sets required to detail or to convert the kit to this version of the F-16. Some will always criticise minor inaccuracies in kits but I am still to see a faultless model, and this kit is one that I am happy to build and be proud to display, particularly in this amazing tiger scheme!